Rise And Run Construction Company and Concrete Visions in Burns, OR offers decorative concrete services. Do you want to enhance your living space with decorative concrete? How about transforming your yard with amazing garden art? Perhaps you would like to make your home more inviting and warm with hand carved stone walls. If so, then you have come to the right place! After 15 years in the construction trades, Rise&Run Construction Co. and Concrete Visions were founded by Bruce Bartley in 1989. We have been a rural, small market general construction company since that time. As our interest in the magic of concrete increased, we have strived to specialize in the advancement of decorative concrete. Diminishing opportunities in our home base (primarily due to the loss of wood products industry jobs) have led us to spread our wings and do our decorative concrete work all over the great State of Oregon. Whether you are in Bend, Medford, Astoria or LaGrande, we are happy to consider your project for suitability to our specialties. Fresh poured concrete is where we started, and it is in our blood. A couple weeks away from the smell of fresh mud leaves us edgy. 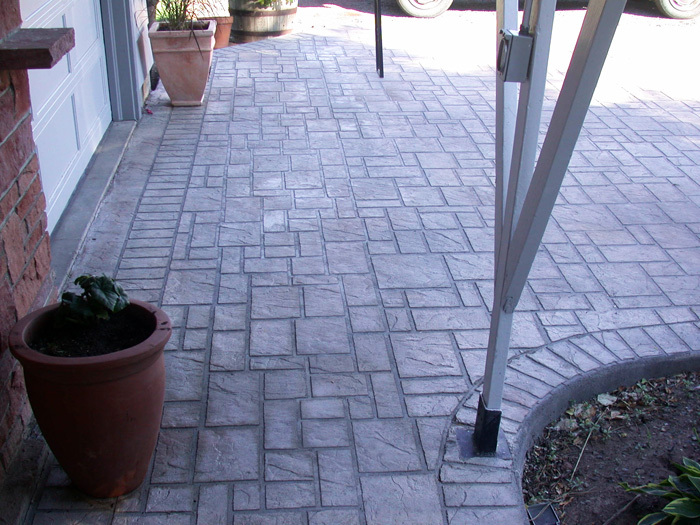 We can stamp or hand-apply pleasing textures, stencil in brick or flagstone patterns. We will color your concrete with everything from color through and through, to natural acid wash stains, to bold colors in the latest technology for concrete coloring. It is nice to get your structural patio floor and decorative treatment all in one shot and it is generally the least expensive option when circumstances allow. In cases where you have existing concrete that needs a facelift, either indoors or out, and removal and replacement is out of the question, it is often possible to re-coat the concrete with special cement mixes designed for that purpose. It provides a seamless and elegant floor where high durability and waterproofing are important. We offer expert installation of many unique texture and color combinations for everything from pool decks to interior floors. It is even possible to build a cement floor on plywood substrate. We have taken floor coatings through the roof, combining them with carbon fiber fabric cores to create a unique line of concrete containers, garden pots and water features. This is still and will always be a work in progress as we come up with new ways to use our process. We are happy to provide input during the design phase of your project, detailing what we can do with color or texture. Copyright © 2013 Rise&Run Construction Co. - Concrete Visions. All rights reserved.